Programmatic advertising is exactly what is sounds like. It’s automated buying and selling of digital advertising through centralized computer-driven ad exchanges and related databases and management platforms. It’s designed to largely replace the old-school human powered aspects to buying and selling advertising through agencies and ad networks, with the goal of driving more efficiency and transparency to both advertisers and publishers. Advertisements can run the full gamut, including digital display, video, mobile, social or other ad creatives and placements. According to Business Insider, in the last several years, programmatic advertising has quickly grown to a $15 billion industry today. Programmatic advertising is forecasted to grow to 65 percent by 2020. So, you better learn this stuff, as it is taking over, and fast! 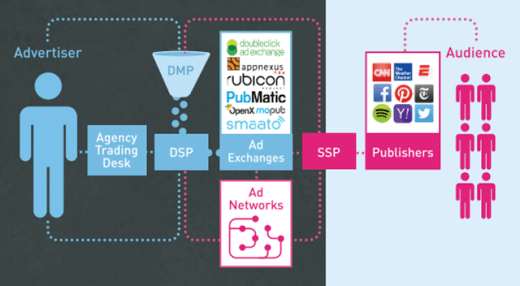 The above graphic did a really nice job of laying out all the pieces of the programmatic advertising puzzle. At the center of the ecosystem are the ad exchanges. These are platforms where advertisers can set up ad campaigns to buy impressions and publishers can offer up inventory to be sold. This computer-driven system replaces the need for human driven ad networks or sales teams. Supply Side Platforms, or SSPs (like AdTrue, OpenX, PubMatic, Rubicon Project, App Nexus, and Right Media), who enable publishers to offer inventory for sale through the ad exchanges, including all revenue analytics. In addition, the huge sites like Google, Yahoo, AOL, Microsoft and Facebook have set up their own programmatic ecosystems, as well. Well, to advertisers, it is typically are far more cost-effective, quick and easy way to plan and place media buys. Programmatic is more cost-effective, quick and easy way to plan and place media buys. Why use humans to research and negotiate with the sales teams of hundreds of publishers, to pay expensive, high rate ad placements? Programmatic buys typically end up at a fraction of the cost (details below), and all with an unbelievable level of consumer targeting capabilities that were historically unavailable. As for why the publishers should care: they may no longer need expensive human sales teams selling out their ad inventory. But, more importantly, given how far lower the CPM ad sales rates are in the programmatic vs. human world, they need to pay particular attention to how far their overall ad revenues may fall by launching programmatic solutions. My guess is, at some point, they won’t have a choice, and all publishers will need to be in programmatic, in one way or another. There are three major types of consumer data sources, used in targeting ads to consumers. First party customer data is the cleanest, directly captured by consumers (e.g., their name, address, demographics), from that specific publisher. Second party data is similar to first party data, in that the data was directly captured from consumers, but is being sold by a third party that did not actually capture the direct data themselves. The benefit of second party data is the greater reach than first-party data, as it can been aggregated from numerous sources. Third party data is anonymized data, captured by companies that that were never involved in any original transaction or engagement with a customer, but can append certain data from third party sources or use sophisticated algorithms to determine key classifiers (e.g., demographics, interests, affinities, behaviors, intent to purchase). There are so many different ways to target your advertising to very specific customer groups. You can target based on audience (e.g, demographics), behaviors (e.g., actions taken), context (e.g., subject matter of content they are reading), intent (e.g., keyword searches or products viewed), location (e.g., based on GPS on their phones) and beacons (e.g., in-the-aisle in stores). Targeting can also be set to identify “look-alikes” to known users, to help increase the reach of your efforts (e.g., if my customers like sports, target other sports fans). Targeting can also be specifically set to hit one consumer across each of their multiple devices, to hit them with multiple impressions on each of their computers, phones, tablets, televisions, etc. when such specific device information is known. Key point, anything that can help signal customer intent, typically helps increase conversions and ROIs around those products. In addition to finding new customers, you can also remarket to past customers or users, to pull them back with additional ad impressions served to them while they are on other websites within the network of publishers in the ad exchanges. How is ad inventory sold? Ad inventory can either be sold on a reserved basis (guaranteed to run) or an unreserved basis (if the excess inventory is there to fulfill your request). And, the pricing can either be fixed (set rates, impressions, budgets) or auction-based (the price will be set at that of the highest bidder). The real-time bidding model is commonly referred to as RTB in the industry. According to Marin, only eight percent of programmatic was reserved inventory/fixed price buys in 2014. But, that’s forecasted to grow to 42 percent in 2016. Ads are sold either on a CPM (cost per 1,000 impressions), CPC (cost per click), CPA (cost per action) or CTC (click through conversion) basis. But, assume most programmatic is typically sold on a CPM basis. CPMs can range wildly based on the quality of the list and the level of targeting. The higher quality the list or the more specific you want to target, the higher the price. Prices also vary by industry, by devic, by format and by placement on the page. But, on average, assume CPMs in the $0.50 to $2 CPM range via programmatic. Which is material savings vs. the $10 or higher CPMs that are typically in the human-driven, non-programmatic world. So, programmatic can help you stretch your limited ad budgets 10 to 20 times farther. Which is music to the ears of most small businesses with limited marketing budgets. I hope this crash course helped you get a better understanding of the programmatic advertising ecosystem and the wide world of options you have to explore there. Good luck!